Motorcycling is one of Florida’s favorite pastimes, with one of the largest numbers of bike owners in the United States. However, many Floridians are unaware of the risk they put themselves up against every time they ride. If you are a motorcyclist and fail to take adequate precautions, you could wind up in a severe accident, and for a variety of reasons, bikers are approximately 28 times more likely to die in crashes. Taking precautions can help you avoid that outcome. Statistics show an enormously inflated casualty rate for motorcyclists when involved in accidents, especially with automobiles. In 2016, there were 10,331 reported crashes in Florida that involved at least one motorcyclist. In those crashes, there were 545 reported fatalities (approximately 5 percent of all riders and passengers) and an astonishing 8,998 injuries – in other words, nearly 88 percent of all motorcycle-related crashes resulted in at least one injury. If one compares the percentages for categories of drivers, it can be seen that the amount is much lower. For example, drivers between the ages of 18-20 experienced 47,467 accidents in 2016. Only 110 fatalities were reported (affecting approximately .002 percent of all crashes), while injuries numbered 12,207 – approximately 26 percent of drivers were injured in their crashes. Why the disparity? 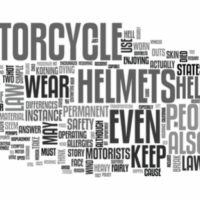 There are many reasons, but the most pivotal is arguably the simplest – motorcyclists simply lack the same physical protection that drivers and passengers in automobiles have. When a motorcyclist strikes an obstacle or is struck by another driver, there is nothing to keep them on their bike; indeed, many motorcyclists die due to being thrown from their bike, rather than the impact itself. Another common reason for motorcyclists being injured and killed more often is the effect of poorly maintained road – bikes are closer to the ground and often may lack the weight and cushion to avoid potholes and other hazards. If you are injured in a motorcycle accident, in theory, your bills will be covered either by your insurance or that of the person who struck you, depending on the situation (Be advised that while Florida law mandates personal injury protection coverage for drivers of 4-wheeled vehicles, this does not cover motorcycles, nor is it strictly required for motorcyclists). If your bills wind up costing more than the amount of insurance coverage available, or if there is a clear display of negligence which injured you, you may decide to bring suit. That said, it is a documented phenomenon in motorcycle cases that sometimes, juries exhibit manifest bias against motorcyclists, for a variety of reasons. Many, especially older people, see cyclists as somehow dangerous or reckless, though there may be no basis for this at all in the fact pattern of your situation. While sometimes juror bias can be overcome or talked around, it is nonetheless a danger that you might receive an unsympathetic juror or two if you choose to file suit regarding your injuries. All that can be done is to attempt to convince them, but it is nonetheless something you and your attorney should be aware of. While most Floridians manage to avoid becoming statistics, if an accident happens, information is one of the most important things you can have on your side. If you need assistance in obtaining compensation for your injuries from a motorcycle accident, call the Winter Park motorbike accident lawyers at the Hornsby Law Group. We have experience in these cases and are happy to try and help you with yours. Call today to set up an initial consultation.